The Labour Party has made its case for winning the next election, launching its manifesto today. We've looked at their claims on borrowing, job insecurity, house building, immigration and social care, taken from Ed Miliband's speech at the manifesto launch, and from the manifesto itself. The government is required to plan for a balanced budget three years into the future. 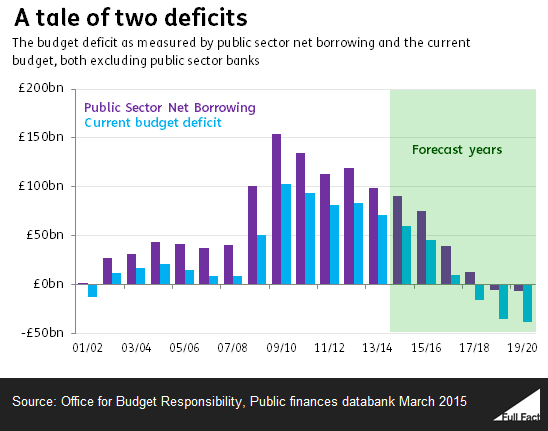 As the IFS points out, the government can technically meet this moving target without ever achieving budget balance. The Coalition is set to meet its supplementary target to have debt falling as a proportion of GDP. Back in 2010, forecasts indicated that the structural deficit would be eliminated by 2014-15 (excluding investment spending). Growth was weaker than expected, and tax revenues weren't as high as was hoped. Overall, the government has borrowed about £100 billion more than it planned to over this parliament. In the last year of the Labour government the deficit including investment was about £150 billion. It was £90 billion in 2014-15 and is expected to stand at £75.3 billion at the end of this financial year. In cash terms, it's fallen so far by 40%. As a proportion of the economy, it's fallen by half. Current forecasts for this measure suggest we're on course for a surplus by 2018-19, but that depends in part on whoever is in government delivering the necessary savings. The areas in which the parties have committed to make savings remains unclear in places, according to the Institute for Fiscal Studies. When Labour say people are £1,600 worse off, they're talking about the weekly median wage compared to the Consumer Price Index measure of inflation. You can find our full article on this claim here. But the change in the median wage doesn't tell us very much about what's happening to individuals. The median wage for people who've been in continuous employment has risen faster than prices almost every year since 2010. The figure is also now a year old. Crucially as well, it only looks at pre-tax wages compared to prices, and not at the effects of taxes and benefits on incomes. There were an estimated 700,000 people on zero hours contracts in their main job at the end of 2014 and around 1.8 million contracts "without guaranteed hours" in the UK, according to the ONS. But comparisons of zero hours contracts over time are not reliable, so it's not possible say by how much the use of the contracts has risen in recent years. We're building about 140,000 homes a year across the UK, which is around the lowest post-war level. Figures before the war are only available for England and Wales and confirm we're building at the lowest peacetime levels. It's not clear whether Labour is talking just about England and Wales (where there were about 118,000 homes built in 2013/14) or the UK for its pledge. 200,000 a year isn't quite double the current building levels in either England and Wales or the UK. Immigration to the UK increased a lot in the late 1990s and had another boost in 2004 when the EU expanded into Eastern Europe. 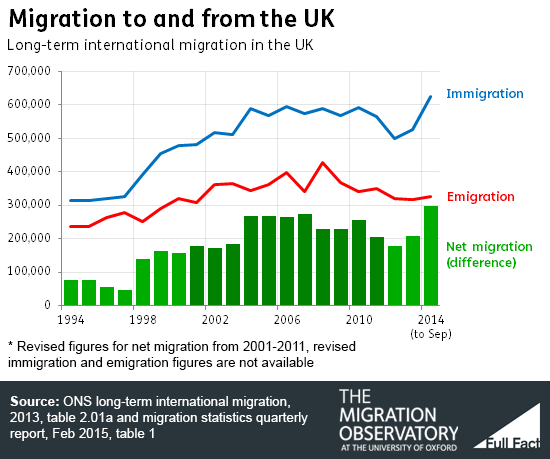 Net migration - the difference between immigration and emigration to and from the UK - stood at about 300,000 last year and has typically been above 200,000 since the mid-noughties. Before then, very rough estimates show net migration barely reaching 20,000 at most as an average over a decade, and was often negative. Local authorities are responsible for funding social care. Reductions to local authority budgets by government have happened alongside a fall in funding social care for over-65s. Between 2009/10—the year before the Coalition took office—and 2013/14, funding for services for over-65s fell by 16% once inflation is accounted for, according to analysis by the Nuffield Trust and Health Foundation. This accounted for a drop of £1.3 billion. In the same period the number of over-65s receiving publicly-funded services fell from over 1.1 million to 850,000, a drop of 290,000. That fall was mostly seen in community-based services which range from meals to help with washing and dressing to help paying for equipment such as grab rails and hoists. It's not a new trend—the number also fell from 2008/09 to 2009/10. Nor is it one that only applies to older people - the number of 18 to 64 year olds receiving care fell from 550,000 in 2009/10 to 420,000 in 2013/14. Updated: 15 April 2015— We added quotes from Ed Miliband's speech to the existing quotes from the Labour manifesto.